I’ve had only one Boulevard beer, their Saison Brett which came in a beer trade. A couple weeks ago I was sent another Boulevard beer from their Smoke Stake series. 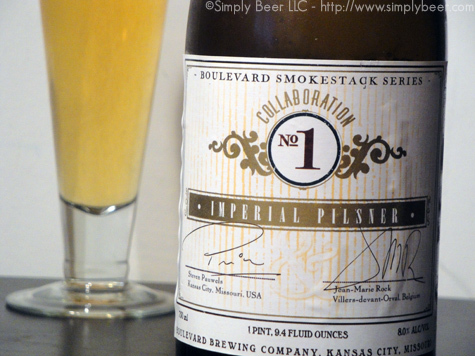 The latest one I received was their Collaboration no 1, an Imperial Pilsner. 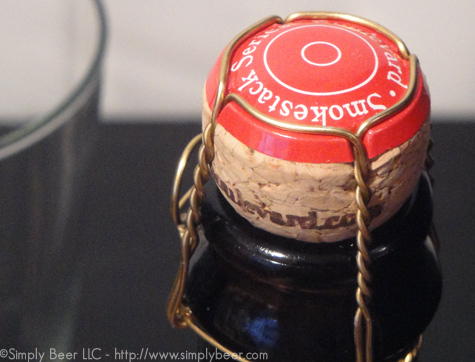 This beer was a collaboration between Boulevard’s Steven Pauwels and Orvals Jean-Marie Rock. With out know anything about this beer, but with Jean-Marie Rock’s involvement it is either going to be a very traditional pilsner and/or something very unique. While there is no info on Boulevards website, I did find this description on Beernews.org. Boulevard Brewing Company today announced that Jean-Marie Rock, brewmaster at Orval, the renowned Trappist brewery located in southern Belgium, will team up with Boulevard brewmaster Steven Pauwels to create a small production, limited release beer. The joint effort, a first for the Midwestern craft brewery, will take place during Rock’s late October visit to Boulevard’s Kansas City facility. The brewers, both native Belgians, will produce an Imperial Pilsner similar to a lager brewed by Rock at the start of his career. It will, according to Pauwels, be a tribute to Pilsner beers; full flavored and refreshing, brewed with 100% Pilsner malt and 100% Saaz hops, using time-honored techniques. 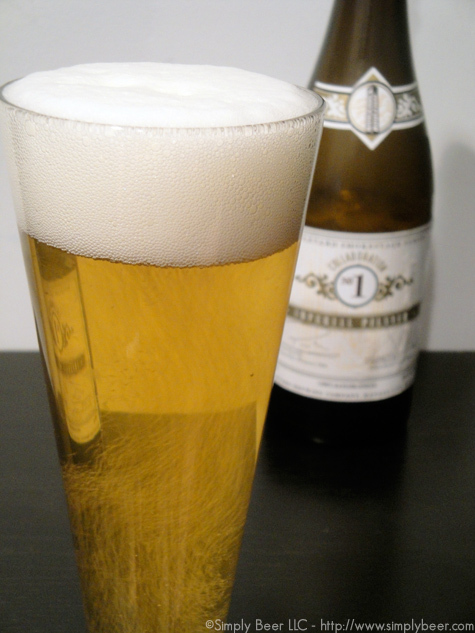 As you would expect from a pilsner, it pours a crystal clear, golden straw color. When first poured there was an amazing torrent of bubbles that swirled up from the bottom (see picture above). Even after a couple minutes in the glass, there was still a nice inverse waterfall of bubbles rising up. This beer also had amazing head , a great little pillow of foam with great lacing. Great aroma, I want to say especially for a pilsner, but that is not fair to the style. This beer had a great noble hop aroma, slightly citrusy with a nice herbal, earthy aroma and a bit of lemon grass. I have to say I’ve never had a pilsner like this. A very full mouth feel, grainy and creamy are my initial impression. There is a very strong lemon grass flavor, a big hit of alcohol and a very refreshing hop bitterness with a hint of spice. Very clean flavors and very enjoyable big beer. But not as dry as you might expect from a pilsner. I found this to be a mighty tasty beer. Great flavor, good hop profile and a nice malt backbone make this a great beer. Even with a big abv and a bit sweeter then your typical pilsner, I would still enjoy this on a hot day. 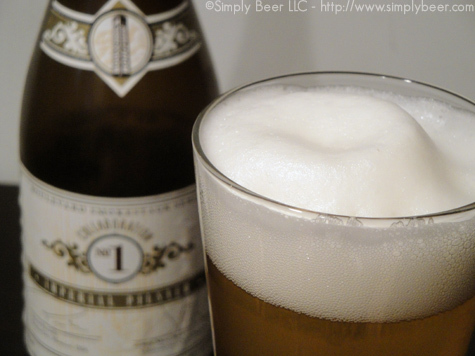 This is probably my favorite pilsner–I reviewed it a while back. When i go to KC next, provided it’s available still, I’m going to load up on these. I was told by Pauwell that this beer was hopped in the mash and in the boil. @nate, yeah this was a good beer, it also was a very pretty beer to look at. I haven’t reviewed many lagers, but I’m glad I was sent this one. Don’t forget to grab one for me, Nate. This sounds very good to my palate. I might have to order some. Lee, I’d highly recommend it. Also get their Saison Brett if you can find it. I actually have a bottle of the Saison-Brett and the Rye-on-Rye waiting to review. I tried the Saison-Brett at the Capt. Lawrence Rosso release the other week – very good. I’ve never understood the concept of an Imperial Pilsner, but this was definitely one of the best ones that I’ve tried. Still very light and refreshing for such a high ABV. @Steve – Yeah Imperial Pilsner is kinda an oxymoron. Hard to make big beers that are crisp, clean, and highly attenuated.